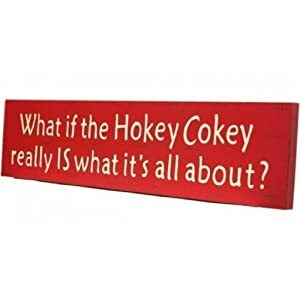 LtQ: What if the Hokey Cokey really IS what it’s all about? Here’s the Hokey Cokey guide to self-actualisation, winning soup for the soul and influencing chickens. Whatever you do, put your whole self into it. Commit commit commit. Except crime, obv. Reach out to others. Embrace the world. You may need your left arm as well for this. It’s good to shake things up sometimes – Etch A Sketch, snow globes. But please go easy with the champagne. And it’s OK to change your life direction. Why not plan a mid-life crisis every five years? Stop! Just… stop! Spend the second before six o’clock in silence and give yourself time to think. Exercise is good, and Brits are especially good at rowing or cycling. Give yourself a gold medal whenever you achieve your targets. Get yourself some cheerleaders. Pompoms are optional. PS. In a more serious vein, the Hokey Cokey is a good example of total physical response, a language-teaching method based on the coordination of language and physical movement.